Panasonic TX-65CZ952B review | What Hi-Fi? The Panasonic TX-65CZ952B is the company’s first 4K OLED TV, and it looks so good that it may very well usher in the next phase in television. Yes, really. This is one of the best pictures we’ve seen. Christmas has come early. Or has it? Of course we are obliged to consider other factors. Take the size: it is only available in 65in, although Panasonic’s label of ‘CZ950 Series’ suggests others may follow. Then there’s the hefty price tag. 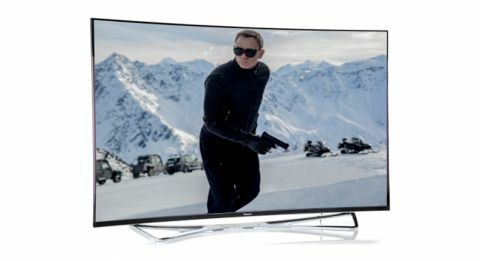 Of course, high-end flagship TVs have never been cheap, but £8000 puts it well out of reach for most. We should also mention the fact it's curved, which won't be for everyone. But we can worry about that later. Right now, we feel the need to effuse. After spending a weekend with the Panasonic TX-65CZ952B, we’ve concluded that it is an unadulterated thing of beauty. We are not alone in that respect: this is the first 4K OLED TV to receive THX certification, apparently as the result of over 400 laboratory tests. Scrutinising this TV is not unlike approaching a sumptuous buffet. Every element looks so appealing that you feel a little bad if you don’t acknowledge them all straightaway. The outstanding element, however, is contrast. We’re already accustomed to OLED images' inherent ability to pop out of the screen, along with their plasma-like black levels, but what we have here goes beyond that. These blacks are the closest we’ve seen to a genuine absence of light. Panasonic calls it ‘Absolute Black’ and we’re inclined to agree. The Panasonic TX-65CZ950 also demonstrates remarkable control and subtlety in the dark. The first OLEDs had issues articulating fine shadow detail. There are no such problems here. We feed the Panasonic a range of shadow-heavy material. The first episode of House of Cards Season 2 begins in a park. It is night and the Underwoods are jogging from background to foreground, occasionally lit by lampposts but otherwise bound by shadows. On many a talented LCD this scene is a dark mess, but the Panasonic makes light work of it, digging up all manner of detail on the trees, the running path and even the texture on the clothing. It has no problem rendering the zip on Kevin Spacey’s sweatshirt, in the dark, from a distance. These sumptuous blacks are consistent with what we saw at IFA 2015 in Berlin, where Panasonic took us to a dark room and played a clip from Oblivion. We saw outlines and textures that we’d never seen before in the film. Take the interrogation scene, where the only source of light is the ember of Morgan Freeman’s cigar. It’s possible to make out the faint outlines of his face and sunglasses. It looks entirely natural, rather than forcibly enhanced. At the other extreme, the picture handles brightness with almost as much skill. We stick with House of Cards and the scene with Robin Wright in her office, which is very white indeed. White walls. White lampshades. White shirt. The light sources are almost too bright to look at, but the shirt is lovely. It is crisp and bright enough to offset shadows while gleaming in the areas where it catches the light. In between are the walls, on which we notice a convincing gradation as the beam from the lamp trails off. That said, we could do with a little more differentiation. The lamps themselves offer a convincing brilliance, but the brightest bits are a little too uniform when compared to the best LED TVs. Top blacks and whites, but what of the colours? We’re pleased to say they are beautiful too. Convincing hues can be a challenge with OLED TVs, which have a tendency to exaggerate. Instead, Panasonic has managed to dial the colours back just the right amount to make them look believable. We note the subtle but definite gradations, especially around awkward contours like elbows and cheekbones. This is particularly effective on skin tones, with people looking remarkably lifelike. Besides brightness and accuracy, there’s the matter of consistency. The issue with some curved screens is the gentle vignetting you can get. There's no evidence of that here. Colours and shading look satisfyingly uniform. The dynamism on offer is such that we are no longer that upset about the ongoing lack of High Dynamic Range material. Speaking of which, HDR standards are yet to be decided but the industry consensus says that it will mean better contrast and better colours. There is very little content out there right now (Amazon Video has some HDR TV shows), but Panasonic says this TV is ready for when more comes. Let’s not forget the Ultra HD element. The 4K works wonderfully with the screen’s clarity and subtlety. You get plenty of texture, drawn with a level of refinement that we’re frankly not accustomed to. Switch from Netflix or Amazon 4K to Blu-ray and there’s an inevitable drop in sharpness and clarity, but this TV is an adept upscaler. The contrast and colour balance holds up no matter what resolution you’re playing at. Motion could be a little better. You’ll want to have motion processing on but set to ‘minimum’ – ‘off’ leads to a bit of stutter, while ‘maximum’ makes the picture unnaturally glossy. How does it look so good? Well there’s UHD and OLED, and their inherent strengths in detail and contrast. The less obvious element here, according to Panasonic, is the 4K Studio Master Processor. Panasonic spends as much time talking about this as it does talking about the screen. The company says it was designed to be as close as possible to a director’s vision, with help from key tech masters in Hollywood. Mike Sowa, a Hollywood colourist who has worked on Oblivion and Kill Bill, was brought in to tune and approve the image himself. Although we could spend all day looking at that screen, the sound is also worth considering. It’s fine for a flat-panel TV, but no match for a proper set of speakers or a soundbar. Considering the price of the unit, we might have expected slightly better. However, it is clear and fairly well balanced. Panasonic has made a curious move with regards to smart content. You get the big apps such as Netflix, Amazon Video and BBC iPlayer, but they’re not presented in a fancy interface. Unlike LG and Samsung, Panasonic does not offer a fancy menu system, instead organising its apps in a single grid-like page. While we’d like a little more song and dance for the money, we do respect the decision to get on with things. This TV is curved, which may annoy some people. It’s not strictly necessary, but we think it looks fine. It’s a very mild curve, gentle enough that some may not even notice it. It also doesn’t stop you from wall-mounting the thing. Don’t fancy wall-mounting? Then you get to use the lovely new stand. It’s an arching, skeletal design, which is solidly anchored to the TV in four places – a lot better than the ‘cinder block’ approach that Panasonic used with its first 4K TVs. You’ll need a fairly wide rack to put this stand on, but it is stable. The highlight is the back panel of the TV, which is upholstered in luxurious Alcantara, an artificial suede substitute found in some sports cars. It’s hard to stop stroking it. Again, it’s not necessary, but a bit of luxury goes a long way on a product this expensive. And it also provides a degree of cable management. Remove this and you’ll find the connections. On the digital front, there are four HDMI sockets, three USB ports and optical. With analogue, you get Scart and component/composite via little adaptor attachments. Internet connectivity is by ethernet or wifi. DVB aerial for Freeview, twin satellite tuners for Freesat. It’s surely no secret that we love the Panasonic TX-65CZ952B. Not only is this beautiful, thrilling picture one of the best we’ve seen, but we’re chuffed that TVs can look this good. The overriding sentiment here is ‘wow’. But reluctantly, we have to give this TV a four-star rating. At £8000, it is just too expensive and nearly £3000 more than its nearest competitor, the LG 65EG960V. For that money, we’d need absolute perfection – a little more white differentiation, a little smoother motion and better sound. And a nice interface wouldn’t hurt. If Panasonic were to knock that price down, we could happily reconsider our verdict. Until then, this one has to remain on our Christmas wishlist.